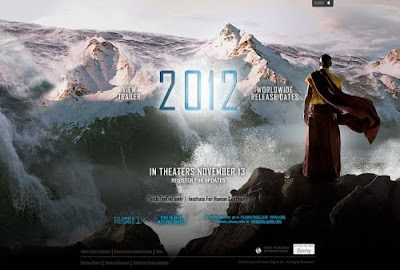 German director Roland Emmerich, a master of the disaster genre, gives us a ringside view of the end of the world in ‘2012’. The magnitude of the cataclysmic events at the End of Time is indeed much more earth-shattering than aliens destroying the White House (‘Independence Day’) or New York being hit by tidal waves (‘The Day After Tomorrow’). The tagline for the latest doomsday epic says: “We were warned.” John Cusack’s character, Jackson Curtis, the chauffer-writer of the unsuccessful book, Farewell to Atlantis, depicting a researcher who opens a portal into a parallel universe, making contact with his double, uses his knowledge of ancient prophesies to ensure that human race is not completely wiped out in the great deluge following massive earthquakes and tsunamis in 2012. There is a plethora of prophesies and their interpretations alluding to metaphysics, cosmology, astronomy, philosophy, new-age spirituality and perennial wisdom regarding the 2012 phenomenon that encompasses human cycles, earth cycles as well as celestial cycles. It also involves the nondual relationship between infinity and finitude, eternity and time. The focal point is the end of the Mayan Great Cycle, the end of time, precisely calculated to occur at midnight on December 21, 2012 during the winter solstice, marking a rare alignment of our planet, our solar system and the centre of our galaxy, one that will not occur for another 26,000 years. The Mayan lore is shrouded in mystery. The Maya “suddenly appeared” over 1,500 years ago in remote areas of what’s today Mexico’s Yucatan Peninsula, Guatemala, and parts of Honduras and Belize. Theirs was an inexplicably much advanced civilisation, and they possessed intriguingly much developed technology for their times. They seemed to have arrived with a most sophisticated galactic clock. Their calculation of cosmic cycles and time is unsurpassed. Besides tracking familiar solar and lunar cycles, the Maya calendar tracks rare celestial alignment of our solar system. They marked the passage of time through a 260-day ritual year, composed of 13 months lasting 20 days each. They also had a 360-day civil calendar. These two calendars coincided every 52 civil years, encompassing 72 ritual years. In addition, they had the Long Count, lasting 1,872,000 days (13 baktuns) or 5125 solar years, which is one World Age cycle. The Long Count that began on August 13, 3113 BC ends on December 21, 2012, when our sun will move into direct alignment with the equator of the Milky Way galaxy. As mysteriously as they came, the Mayan timekeepers left their temples, observatories, pyramids and their greatest cities and walked into the forest and disappeared, sometime during 9th Century AD – leaving behind some of the most baffling archaeological mysteries ever uncovered. The Mayan gods were avatars of certain stars and planets. The Maya believed the “first father” of the human race was the maize god who came from and eventually returned to Orion. Mayan traditions speak of the return of the Quetzalcoatl, the mythical feathered serpent of Mesoamerica that symbolises the union of snake and bird or Earth and Heaven. Could the end of Time also mean a great transition for the humans, a cosmic window of opportunity to reach for the stars? I think we all need to give a thought to the doomsday concept because I just came across this documentary on history channel-and it was quite shocking. I dont know about the credibility factor for the document. But still, sounds interesting. Nostradamus believed the world would last till 3797 AD, allowing total planetary lifespan of approximately 7970 years. So, guys, you'd all survive 2012! Or as Blavatsky would have us believe, we'd all meet on Planet Mercury! It's so intriguing to think what future holds isn't it... Nothing lasts forever... so live up to the fullest... Thank u all for ur comments. The prophesies keep coming. Each one more convincing than the other. Thanks for the input vimal. Really appreciate it!